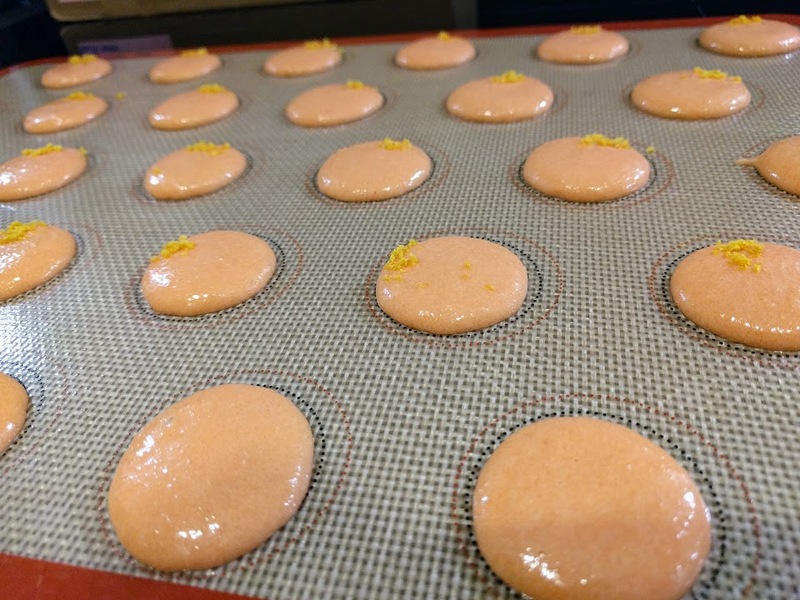 A basic macaron recipe, that once mastered can be modified to many different flavor and filling combinations. Makes 15 medium macrons, 3cm in diameter, about 150g of unbaked mixture. Prepare a tepmlate of circles on a sheet of paper to place under your baking parchment while you pipe. The circles should be about 3.5cm in diameter, with a spacing of about 2.5cm appart. Or use a silicone macaron mat if you have one. Start by combining the sifted almond flour and icing sugar in small bowl, put to one side for later, but keep your sifter close by. In a scrupulously clean bowl, with a spotless electric whisk, beat the egg white with the salt until soft peaks. Once you reach soft peaks, add the sugar in 3 goes, whisking continuously until you reach stiff peaks. Hold the bowl over your head to make sure those peaks are indeed stiff. This is the point where you should add any gel food colouring – always add more that you think you need, as when you bake, the colour will fade. Do not add any liquid food colouring or flavouring; this will alter the ratio of dry to wet ingredients and your macarons may not bake well. If using powdered colouring or flavouring add it into the icing sugar and almond flour now. Sift in 1/2 of the icing sugar and almond flour into the egg white, fold in gently taking care not to deflate the egg white. Repeat this process untill all is combined. Now you are ready to pipe onto your baking sheet. See this post for piping tips. Use a round writing tip between 0.5 -1cm in diameter. Pipe holding the piping bag vertically, and fill your circle templates. Take the template paper out from underneath your baking sheet before baking. Heat the oven to 140 C Fan. Bang your baking tray on a hard surface to get rid of air bubbles, and use a toothpick to pop any bubbles on the surfaces of the shells if you can see them. Then leave your shells out to air for about 30 minutes – 1 hour; until you can smoothly run your finger over the surface. Bake for 14-16 minutes. Opening the oven door half way through to let steam out. If you added powder colour/flavour, the macarons will need less time in the oven. If you added gel colour/flavour, the macarons will need more time in the oven. Leave to cool completely before pealing off your baking sheet. Pipe your chosen filling, and sandwich the shells together. For fillings, flavours and colours see this post.